The house for manual cutting is a unique structure, in which the texture of the tree species is preserved. Unlike rounded logs, the log house of manual felling is more expensive in cost, but has an improved structure, since it preserves the natural upper layer of the tree. 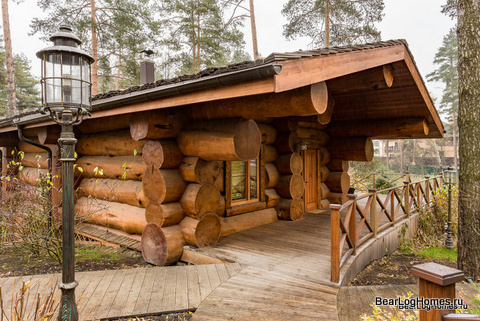 When choosing a log house it is necessary to take into account its quality. The most worthy logs are obtained from the forest of the northern latitudes of winter felling. In comparison with the southern tree, it is more resistant to temperatures and has better properties of moisture resistance and thermal insulation. The reason for this is in more severe climatic conditions, which slow down the natural growth of the trunk. As a result, a larger number of annual rings is required for the same diameter of the log. Most of the logs on the market are coniferous species, in particular pine. This is due to the reinforced structure and is related to the properties of the resin. But not every tree is suitable for use in the construction of a house for manual cutting of premium class. The material is screened and sorted, leaving only quality and healthy trees without defects, flaws and rot. The percentage of unsuitable logs can be 60 - 70%. Blanks have a different diameter, which is due not only to the aesthetic appearance of the house, but also to the region of its location and destination. For example, in southern latitudes the optimal parameters are 220 - 240 mm, whereas in the north, the diameter is usually more than 240 mm, but for a summer house the forest with smaller parameters is also quite suitable. They use trees of different breeds. So the frame from larch for the price and quality is not inferior to the coniferous. Even the first-class selected and processed wood - not a guarantee of a comfortable life in the house. About 50% of success depends on the masters who will be engaged in manual cutting and making the fit of the frame in the bowls and grooves. This is a rather laborious process, requiring accuracy and time, so the price of manual cutting of houses is appropriate. There are several types of logs: in the bowl, in the paw, in Norwegian, Canadian technique, under the lub and plane. The most common are the Russian, saddle, diamond notch and Scandinavian style. Our logbuilders have all the above techniques in perfection, which makes it possible to implement the most complex projects. At the request of the customer we offer the development of design, layout and arrangement of furniture. The final price of a house from a log of manual cutting depends on the area, finishing materials, individual wishes. For consultation, please call + 7 902 9966727.